The mid-tenth century was a critical point in the relations between Russia and the Byzantine Empire. These relations had begun in-auspiciously a hundred years earlier, in June 860, when a fleet of Viking ships from Kiev attacked the suburbs of Constantinople and besieged the city. During the first half of the tenth century the Russians launched three further campaigns against Byzantium. From a military point of view, none were successful. Some, however, were followed by peace treaties. Fortunately, the text of these agreements has been preserved and embedded in the Russian Primary Chronicle, the earliest document recording in a continuous narrative the history of the Russian people, which dates in its final form from the early twelfth century. These treaties show how the Varangian masters of Russia and their Slav subjects, through trade, diplomacy, and human contact, were drawn ever closer into the economic and political orbit of Byzantium. Christianity soon followed in the wake of these contacts. Russian merchants and mercenaries, and diplomatic envoys from both countries, travelling between Kiev and Constantinople, acted as carriers of new ideas, beliefs, and fashions. The recorded beginnings of Christianity in Kiev go back to the sixties of the ninth century, to the years immediately following the Russian attack of 860. The history of this first bridgehead established by the Byzantine Church on Russian soil remains obscure. It was doubtless submerged, later in the ninth century, by a wave of paganism coming from Scandinavia and northern Russia. Yet it did not completely perish; and a chain of evidence suggests that a Christian community may have survived in Kiev, continuously or with brief interruptions, during the first half of the tenth century. The situation began to change in 945, when Olga, the widow of Igor, Prince of Kiev, gained power in Russia. For the next twenty years she acted as regent for her young son, Svyatoslav. Olga was the first reliably attested Russian ruler to embrace Christianity. Yet her religious policy remained tentative and incomplete. The world of Christendom then stood before Russia in the guise of two empires-the Byzantine and the German-both seeking the allegiance of this powerful country. The Western Empire, recently restored and organized by the Saxon kings of Germany, was embarking on a career of expansion in central, northern and eastern Europe; in the tenth century its spiritual partner, the Roman Church, scored some remarkable triumphs: the Christianization of the Baltic Slavs, the foundation of the bishopric of Prague, the conversion of Poland, and the spread of Christianity to Scandinavia. Western Christendom seemed to be advancing on Russia, in the wake of the German Drang nach Osten. The Eastern, or Byzantine, Empire held undisputed sway in eastern Europe, where it had converted the Balkan Slavs and part of the Hungarian nation, and had made several attempts to evangelize the Russians. Between these two Christian empires, Russia in the mid-tenth century, at a vital moment of her history, stood at the crossroads: was Byzantium or Rome to claim her final allegiance? This dualism was mirrored in Olga's ecclesiastical policy. Almost simultaneously she was baptized into the Byzantine Church and asked for a Latin bishop and priests from Otto I of Germany. A German bishop was sent to Kiev ; but Olga's influence was then on the wane and she was powerless to arrest the pagan reaction spearheaded by her son, Svyatoslav. The unwanted bishop had to return home. And yet, although Olga was unable to impose her religion on her subjects at large, her relations with Byzantium paved the way for the eventual triumph of Byzantine Christianity in Russia in the reign of her grandson, Vladimir. She deserves the epithets given her by the Russian Primary Chronicle: "the precursor of the Christian land, the morning star before the sun, the dawn before the light" (1). This paper is concerned with one aspect of Olga's foreign policy: her relations with the Byzantine Empire. This, as I hope to show, is a subject that touches directly on two other questions of major historical importance: the time and place of Olga's baptism and Kievan Russia's international stance in the mid-tenth century. The journey to Constantinople of Princess Olga of Kiev, and the related question of where and when she was baptized, have long been the subject of scholarly debate (2). The last fifteen years, in particular, have seen a renewed interest in this problem. No less than five major studies have been devoted to it: substantial articles by George Ostrogorsky (3), by the French medievalist J.P. Arrignon (4), by the Greek historian B. Feidas (5), and by the Soviet scholars A.N. Sakharov (6) and G.G. Litavrin (7). Ostrogorsky starts from the problem of sources, a problem which, in his somewhat understated words, presents a certain methodological interest (8). The problem can be defined as follows: three medieval sources, clearly independent of each other-the Russian Primary Chronicle, the Latin Chronicle of Adalbert of St. Maximin (the Continuator of the Abbot Regino of Prum) and the eleventh-century Byzantine chronicler, John Skylitzes -all assert that Olga was baptized in Constantinople. On the other hand, the'Book of Ceremonies of the Byzantine Court,' which includes a detailed account of Olga's reception in the Byzantine capital in 957, compiled or at least edited a year or so later (9) by the same Emperor Constantine VII Porphyrogenitos who acted as her host, does not so much as mention her baptism. To which are we to attach greater importance: to the combined evidence of three independent and near-contemporary sources (Russian, Latin, and Byzantine) testifying to Olga's baptism in Constantinople; or to the negative evidence of the one contemporary source where, had this baptism occurred, one would expect to find it mentioned? Ostrogorsky favours the argument'from silence', and believes that the negative evidence of the'Book of Ceremonies' excludes the possibility that Olga was baptized in Constantinople. In his opinion, she was already a Christian when she arrived in the Byzantine capital, having been baptized a few years earlier in Kiev. B. Feidas, by contrast, attributes decisive importance to the unanimous evidence of the Primary Chronicle, the Continuator of Regino, and Skylitzes, and believes that Olga was baptized in Constantinople in 957. In his view, however, the principal aim of her journey was commercial, not religious. The regent of Russia, he believes, wished to extend the trading privileges earlier granted by the Byzantine government to the Russian merchants. As for the vexed question of the purpose of the embassy which Olga dispatched in 959 to Otto I, Feidas rejects the view of those historians who believe that she hoped to obtain from the German king (later emperor) an independent church hierarchy, which it is alleged, the Byzantines had refused to grant her. In Feidas' view, Olga's embassy to Otto I pursued'purely political' aims, the principal one being to conclude a military alliance against the Magyars, who were then threatening Kievan Russia, Germany and Byzantium (10). J.-P. Arrignon is mainly concerned with the problem of the time and place of Olga's baptism. He believes, together with Ostrogorsky, that had she been baptized in Constantinople in 957 Constantine VII would undoubtedly have mentioned it. Unlike Ostrogorsky, however, he considers that she was baptized after her visit to Constantinople. As arguments he adduces the fact that in the'Book of Ceremonies' Olga is described by her pagan name, Elga (Ἔλγα), and not by her Christian name, Helen, and also the general impression which he derives from this account that Constantine regarded her as a pagan princess. Arrignon believes that she could well have become a Christian in Kiev at the end of 959, after the death of Constantine VII, in the reign of his son Romanos II, at a time when the Byzantine plans for the reconquest of Crete were probably accompanied by diplomatic negotiations aimed at securing the aid of Russian mercenaries. As for Olga's two embassies -to Constantinople in 957 and to Germany in 959 -the first in his view was caused by the change of direction in Byzantine diplomacy north of the Black Sea, according to which the Russians were to replace the Pechenegs as guardians of the Empire's interests in that sector, while the second embassy aimed to conclude a commercial treaty between Russia and German Reich similar to the treaties concluded in the tenth century between the rulers of Kiev and Byzantium. A.N. Sakharov discusses Olga's journey to Constantinople against the background of the developing diplomatic relations of the Russian state in the middle of the tenth century. In his view Russo-Byzantine relations were affected in this period by three basic factors: the terms of the Russo-Byzantine treaty of 944; Russia's'official' conversion to Christianity (still to come); and the international prestige of the Russian state and its rulers. Sakharov considers at some length the story, told in the Russian Primary Chronicle, of Olga's alleged baptism in Constantinople, a story loaded with improbable, humorous and at times outrageously chauvinistic details. The Emperor Constantine, we are asked by the Russian chronicler to believe, was so struck by Olga's beauty and intelligence that he conceived a plan to marry her. The cunning Russian princess, aware of his designs, promptly demanded to be baptized and persuaded him to be her godfather; and the unsuspecting emperor fell into the trap. When, on emerging from the baptismal font, Olga was offered the emperor's hand, she was able to point out tartly that such a marriage was contrary to the Christian law; to which the defeated emperor had no option but to reply:'You have outwitted me, Olga" (11). Despite the presence of these manifest fictional details, Sakharov is at pains to point out that the account in the Primary Chronicle does have a sound historical kernel; and although he nowhere states this unambiguously, he seems to believe that the Russian princess was baptized in Constantinople. G.G. Litavrin devotes his article to a critical study of the relevant sources. These he divides into three groups: the Russian (represented by the Primary Chronicle, and the'Memory and Eulogy of Prince Vladimir' by James the Monk); the Latin (i.e. the chronicle of Adalbert); and the Byzantine (i.e. the Book of Ceremonies and the chronicle of Skylitzes). His conclusions regarding the Russian documents are similar to those of Arrignon. 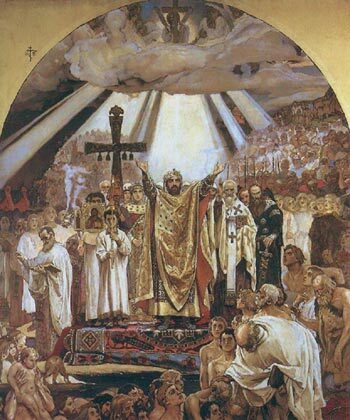 The Primary Chronicle dates Olga's baptism to the year 6463 A.M. (September 954-August 955 A.D.). James the Monk, on the other hand, states that she lived after her baptism for fifteen years and died on 11 July 64 77 (969 A.D.). Some scholars have attached great importance to the fact that these two sources are in virtually complete agreement on the date of her baptism. In fact, however, this coincidence is of minor importance, since one of these sources could well be dependent on the other, and as both Arrignon and Litavrin rightly observe, there is no way of confirming the accuracy of the figure'fifteen' in James' statement. The evidence of the'Memory and Eulogy of Prince Vladimir' on Olga's baptism must hence be treated with caution. Turning to the evidence of the Continuator of Regino, Litavrin concludes that Olga was baptized before she dispatched her embassy to Otto I; more precisely, before her envoys arrived in Germany during 959. The statement of Skylitzes that she was baptized in Constantinople he views with scepticism, since this tradition (which appears likewise in the Russian and Latin documents) could be based on confusion arising out of the chronological proximity of two different events-her journey to Constantinople and her baptism. Litavrin's conclusion is that she'apparently' made the decision to become a Christian during her stay in Constantinople. He provides, in addition, a most useful analysis of the fifteenth chapter of the second book of the'Book of Ceremonies,' which describes the reception in Constantinople of Olga and of three Arab rulers, the emir of Tarsos, the emir of Melitene, and the khalife of Cordoba. Finally, we should note that Litavrin shows considerable caution in approaching the question of the time and place of Olga's baptism. This question, he notes in the concluding passage of his article, should be examined in the broader context of Russo-Byzantine relations in this period. This aim is beyond the scope of my paper. Its purpose is more modest: to show that Olga was still a pagan when she left Constantinople, and that her baptism should be dated to a time after the autumn of 957 when, it must be assumed, she was back in Kiev. This is not a novel view. It was held by several Russian pre-revolutionary historians (12), and was recently put forward, though briefly, by J.-P. Arrignon. G.G. Litavrin, without committing himself very explicitly, seems inclined to this view also. I believe that a number of new arguments can be found to support this hypothesis. (1) The presence, attested in the'Book of Ceremonies,' in her retinue of a priest named Gregory (ὁ παπᾶς Γρηγόριος) whom Ostrogorsky considers to have been her chaplain. (2) The virtually total agreement between the Russian Primary Chronicle and the'Memory and Eulogy of Prince Vladimir on the date of Olga' s baptism (954-955). (3) The details of Olga' s reception in Constantinople which, in Ostrogorsky' s opinion, show that she was treated by her Byzantine hosts with quite exceptional consideration and honour. These details are given in the fifteenth chapter of Book 2 of the'Book of Ceremonies" (13). The day (Wednesday, 9 September) began with two formal audiences at which she was received, standing together with some of her retinue, first by the emperor and then by the empress. There followed a more informal meeting when she sat in the company of the emperor and his family, and spoke to the emperor'of whatever she wished' (ὅσα ἐβούλετο). Later that day a banquet was held in her honour, at which she was invited to sit at the empress' table together with the highest ranking ladies-in-waiting. To emphasize still further these exceptional marks of respect, the text of the'Book of Ceremonies' states that on entering the banquet hall her female companions paid their respects to the empress and her daughter-in-law by prostrating themselves to the ground (προσκυνησάντων), while Olga confined herself to slightly bending her head (τήν κεφαλήν μικρόπν ὑποκλίνουσα ). In Ostrogorsky' s view these marks of special respect-not least the informal meeting with the emperor and the invitation to sit at the empress' table with the highest ranking ladies of the Empire-show that "the regent of Russia, having accepted Christianity, having become the spiritual daughter of the Byzantine empress, and joined the family of Christian rulers over which the emperor presided, took an honorable position in the Byzantine hierarchical system" (14). It seems to me, however, that none of Ostrogorsky' s arguments prove that Olga was a Christian when she visited Constantinople. Let us consider each of them briefly. (1) The presence of the priest Gregory in her party can be explained in different ways. The Byzantine authorities, who were clearly interested in the conversion of the regent of Russia, may have sent him to Kiev in the hope of persuading her to travel for this purpose to Constantinople. It would have been natural for Gregory, were he entrusted with such a task, to be included in the delegation which travelled with Olga from Kiev to Constantinople. There is yet another possibility: Gregory may have belonged to the group of specially qualified clerical diplomats, whom the Byzantine government often used to conduct delicate negotiations with neighboring states; in this case he could well have been entrusted with the task of preparing the agenda for the political discussions which the Byzantine government planned to have with Olga in Constantinople (15). (2) The chronological data of the Russian sources relating to Olga's baptism, as I have already suggested, should be treated with caution. This applies equally to the Primary Chronicle and to the'Memory and Eulogy of Prince Vladimir'. (3) The marks of respect, shown to Olga by Constantine Porphyrogenitos and his family, have no specifically Christian features. All of them can be explained within the context of purely secular relations between Byzantium and the Kievan state. There are, indeed, cogent reasons for supposing that the purpose of Olga's journey to Constantinople in 957 was primarily commercial and political. The very composition of her party is evidence of this. It included her nephew and other relatives, her retainers and those of her son, Svyatoslav, twenty or twenty-two envoys of other princes of Russia (οἱ ἀποκρισιάριοι τῶν ἀρχόντων τῶν ἀρχόντων Ρωσίας) and forty-three or forty-four merchants (16). The character of this impressive delegation is hardly compatible with the theory that Olga journeyed to the Byzantine capital in order to be baptized. However, its size and composition become completely intelligible if we recognize that she pursued quite definite commercial and political aims. She presumably discussed them with the emperor during her first audience with him. It is possible that she requested some changes in the clauses of the Russo-Byzantine treaty of 944, less favorable to the Russians than the previous treaty of 9 11 (17). It is probable, as Arrignon supposes, that the two parties discussed on the same occasion the terms of a new political and military alliance between Kiev and Byzantium. And it is also not impossible that Olga hoped to arrange a marriage between her son, Svyatoslav, and a daughter of Constantine VII. Indeed, such matrimonial schemes may well be reflected, in a fictional and chauvinistic form, in the Primary Chronicle' s story of the wooing of Olga by Constantine VII (18). There is no doubt that a military alliance with the powerful Kievan realm would have been of great benefit to the Byzantine Empire, which was then waging an intensive war on its eastern frontier against the Arabs. An extremely valuable piece of evidence comes from the contemporary Arab writer, Abu Firas, a cousin of the Empire' s principal enemy on the eastern front, the formidable emir of Aleppo, Saif-ad-Daulah. In 958, he tells us, after the Byzantines had fought several battles against the forces of Saif-ad-Daulah and vainly attempted to conclude a truce with him, "Constantine, the son of Leo, emperor of the Romans (Rum), began peace negotiations with the neighboring peoples... he signed peace agreements with the rulers of the Bulgarians, the Russians, the Turks, (i.e. the Hungarians), the Franks and other nations, and requested help from them" (19). "Help" from the Russians, as we know from the text of the treaties they concluded in the tenth century with Byzantium, consisted above all in the dispatch of mercenary troops from Kiev. This is confirmed very neatly by a passage in the Russian Primary Chronicle which states that on her return from Constantinople to Kiev, (presumably therefore late in 957 or early in 958) Olga received an embassy from the emperor, complaining that she had not yet sent him the promised "slaves, wax and furs, and soldiers to help me" (20). The evidence concerning Olga' s reception, which we have extracted so far from the'Book of Ceremonies,' does not, I suggest, support the view that Olga was a Christian, either when she arrived in Constantinople or when she left the city to return home. I now propose to go a step further and attempt to prove, by positive arguments, that during her stay in Constantinople she was still a pagan. In the very first sentence of the passage in the'Book of Ceremonies' which describes Olga' s reception, it is stated that this reception was'in all respects similar to the one described above'. The description of Olga's reception is immediately preceded by accounts of audiences accorded in the Byzantine capital to ambassadors from various regions of the Arab world. The last in succession was the reception on 31 May 94 6 by Constantine VII and his son and co-emperor R ο manos II of envoys from the emir of Tarsos, who had come to Constantinople to conclude peace and arrange an exchange of prisoners. If Olga had been a Christian in 957, her reception would hardly have been'in all respects similar' to that of the Muslim envoys. It is hard to believe that some detail of a Christian ceremonial or ritual would not have been included in the account of her reception. Furthermore, the envoys from Tarsos on the Christian feast of the Transfiguration (6 August) were admitted to the Τριβουλάριον (an atrium within the palace complex), where they watched the emperor leaving the palace for the Church of Hagia Sophia and later returning from there (21). Olga's stay in Constantinople coincided with the feast of the Exaltation of the Holy Cross (14 September). In the'Book of Ceremonies' this fact is passed over in silence. May one not suppose that, had Olga been a Christian, she would have been invited to take part in the ceremonies of this feast? Nor is there any evidence that those members of the emperor's palace guard who were both Russian and Christian (οἱ βαπτισμένοι Ρῶς) (22), Olga' s compatriots, were present during her meeting with the imperial family-which one might have expected if she had been a Christian. Even more striking perhaps is the silence of the Russian pilgrim, Dobrynya Yadreikovich, better known as Antony, Archbishop of Novgorod, who visited Constantinople in 1200. There, in the Church of Hagia Sophia, he was shown'a large ritual golden dish which belonged to Olga the Russian, when she took tribute, having come to Constantinople' (23). It is hard to believe that a Russian pilgrim, who was the future archbishop of Novgorod and, therefore, close to church circles, would not have mentioned Olga's baptism, had it taken place before she left the Byzantine capital. It has often been noticed that in the'Book of Ceremonies' Constantine VII calls the Russian princess by her pagan name, Elga (Ἔλγα) and not by the Christian name, Helen, which she took on her baptism, probably in honour of the Empress Helen, the wife of Constantine VII. We know that Olga was baptized as Helen from three sources: the Russian Primary Chronicle, the'Memory and Eulogy of Prince Vladimir,' and the chronicle of Adalbert. The Byzantine tradition normally required the sovereign of a country newly converted to Byzantine Christianity to assume on baptism the name of the reigning emperor. It was, hence, natural for Olga to take, on the occasion of her baptism, the name of the imperial consort of Constantine VII (24). It seems unlikely, if on her arrival in Constantinople Olga had already borne the name of Constantine's wife, that he would not have mentioned it. The most weighty argument, however, in favor of the view that Olga departed from Constantinople still a pagan is the outcome of her embassy. We know from the'Book of Ceremonies' that her delegation was received by the emperor twice: on 9 September and 18 October. What was Olga doing during the thirty-eight days between these two audiences? A partial answer to this question is given by the Primary Chronicle, which cites her reply to the emperor's demand for the promised slaves, wax, furs, and mercenary troops. "If," she is reported to have said in her message to the emperor, "you will wait in my country on the Pochaina for as long as I waited in the Golden Horn, then I will give you what you demand" (25). The full import of this message will become apparent if it is remembered that the Pochaina is a small river which flows into the Dnieper near Kiev, and the Golden Horn is the harbor of Constantinople. The ironic tone of Olga's reply recalls her humorous dialogues with the Drevlyane in the semi-legendary account of the atrocities she inflicted upon them in the Primary Chronicle (26). There can scarcely be any doubt, however, of the historicity of her message to the emperor, in content if not in form. Wax, furs, and slaves are frequently mentioned in the documents of the time as the main articles of export from Russia to Byzantium. Russian mercenaries, serving in the Empire's armed forces, are mentioned in the text of the Russo-Byzantine treaties of 911 and 944 (27). They took part in the abortive Byzantine Cretan expedition of 949 (28) and also in Nikephoros Phokas' campaign against Crete in 960, which led in the following year to the conquest of the island (29). As for Olga's'waiting' in the Golden Horn, this detail seems only too authentic. The Byzantines had learned from long and bitter experience the need to exercise the utmost caution in permitting groups of armed foreigners-more particularly Russian Varangians -to enter Constantinople. The sheer size of Olga's delegation suggests that she arrived in Byzantium with a large fleet. It is not surprising that between Olga's first and second audience the Russian delegation was forced to remain at anchor in the Golden Horn, outside the city walls. The only possibly surprising thing is the length of the wait-more than five weeks (30). This humiliating delay could not fail to irritate the proud Russian princess. If we are to believe the Primary Chronicle, this irritation caused her to refuse, at least for a time, to honor the promises she had given the emperor in Constantinople. Perhaps, as we shall see, her displeasure had other reasons as well. In any case this scarcely suggests that her negotiations with the Byzantine government in 957 had a successful outcome. Another pointer to the probable failure of these negotiations can be found in the brief account of the second reception of the Russian delegation, on 18 October. Historians so far have paid scant attention to this second audience. Several of its details are not without interest. The account begins as follows: "On 18 October, on a Sunday, a banquet took place in the Chrysotriklinos [the palace's central hall]. The emperor sat together with the Russians (καί ἐκαθαιρέθη ὁ βασιλεύς μετά τῶν Ρῶς). Another banquet took place in the Pentakouvoukleion of Saint Paul's [a formal dining hall within the palace complex], and there sat the empress with her children born in the purple, with her daughter-in-law and the archontissa [the princess, i.e., Olga]. We can infer from this account that this time Olga did not even meet the emperor. Only the "Russians"- that is presumably the diplomats and merchants who had come with her as experts and technical advisers-were invited to the emperor's board. Olga had to be content with dining in the company of the empress and her family. We gain the impression that during this second reception the Russian diplomats and merchants were merely informed of the Byzantine government's decision on matters which Olga had discussed with the emperor at her first reception. No mention is made of any talks or discussions. Finally, it is interesting to compare the sizes of the monetary gifts received by the members of the Russian delegation from the imperial exchequer during the two receptions on 9 September and 18 October. Olga received on the first occasion 500 miliaresia (silver coins, the total sum approximately equal to 42 nomismata (bezants, or gold sovereigns); on the second occasion she was given only 200 miliaresia. Her nephew received 30 miliaresia the first time, and 20 the second. Each of the Russian merchants received 12 miliaresia at the first reception, and only 6 miliaresia at the second. Other donations remained unchanged: their recipients were the envoys of the Russian princes (12 miliaresia each), the priest Gregory (8 miliaresia) and two interpreters (12 miliaresia each). What was the reason for this considerable reduction in the size of the gifts received by Olga, her nephew, and the Russian merchants? (31) An attempt to explain the differences in the sums of money was made in 1908 by the distinguished Russian art historian, D.V. Ainalov (32). In his opinion the monies paid out to Olga and her companions were not gifts (and are not, he rightly notes, called'gifts' in the'Book of Ceremonies'), but a kind of allowance, similar to the'maintenance' (slebnoye or slyubnoye) which by the terms of the Russo-Byzantine treaties of 907 and 944 was to be paid by the imperial government to the Russian envoys (though not to merchants) during their stay in Constantinople (33). In support of his theory, Ainalov cites another passage from the'Book of Ceremonies' which describes the formal leave-taking by envoys from Italy to Byzantium. Before departure each of the envoys'men' or retainers (τούς ἀνθρώπους αὐτούς) was given his'stipend' (τήν ρόγαν) by the emperor; the sum of money to be received by each of the envoys and their'men' being determined in advance with the emperor's approval (34). In Ainalov's view the sums paid to Olga and her companions at their second reception were calculated as maintenance allowance to cover the period between the two receptions, i.e. between 9 September and 18 October; while the sums paid to them at the first reception, being larger, were computed to cover a period longer than thirty-eight days. This leads him to the conclusion that a considerable time elapsed between Olga's arrival in Constantinople and her first reception by the emperor. Ainalov's arguments seem to me unconvincing. It is true that the monies paid to Olga and her companions are not called'gifts' in the'Book of Ceremonies.' It is merely stated that they were'given' (ἐδόθη) to the Russian princess, while on 9 September the other members of her party'received' them (ἔλαβον). The absence of the noun'gifts' (δῶρα) is probably intentional. According to the Byzantine political theory, the emperor was supposed to receive, not distribute'gifts' (35). This followed from his sacrosanct position as the symbolic representative of Christ on earth; Constantine Porphyrogenetos himself in the'Book of Ceremonies' compares the emperor' s role in court ceremonial to the position of Christ among his apostles (36). And Christ himself, as was well known, received'gifts' (δῶρα) from the wise men. The'Book of Ceremonies,' in my view, does not support Ainalov's thesis. However vague the terminology used in this passage, there is no doubt that the monies, paid out to members of the Russian delegation, were considered by both parties to be gifts, and were regarded by the Byzantines as an expression of imperial bounty. There is nothing in the text to suggest that they were regarded as a form of diplomatic maintenance allowance. Ainalov's example of the envoys from Italy has no relevance whatever to conditions of the tenth century. The passage he cites, as J.B. Bury proved in 1907 (37), was written in the sixth century, probably by Peter the Patrician, and reflects wholly different political circumstances. The notion of'stipend' (ρόγα) could have been applied to Italian envoys by Justinian's government in the 30s of the sixth century. It could not be applied in any meaningful sense to the regent of Russia in the mid-tenth century. Ainalov' s third argument is, in my view, equally implausible. If the sums received by Olga and her companions were really calculated as maintenance allowance for specific periods of time, we would conclude that 200 miliaresia paid to her on 18 October were reckoned as her stipend for 38 days. Consequently, in order to earn the 500 miliaresia she got on 9 September, she would have had to wait in Constantinople-assuming that the same per diem rate applied-for 95 days (i.e. more than three months) before her first meeting with the emperor. It is hard to believe that the regent of Russia would have agreed, even for the strongest commercial and political motives, to remain at anchor with her numerous retinue outside the walls of Constantinople, awaiting the emperor' s final decision, for 133 days, i.e., more than four months! Is it not more natural to see in the reduction in the size of the payments further evidence to support the view that Olga failed in 957 to extract from the Byzantine government satisfactory political and commercial terms, and returned home affronted and displeased? We do not know the true reasons for this diplomatic failure of the Russian regent. There are grounds for suspecting that Constantine VII was no great lover of the Russians, nor particularly well disposed towards the Kievan state, for all the pressing circumstances which made an alliance with it expedient for the Empire. In his treatise'On the Administration of the Empire,' whose first eight chapters lay down the foundations of Byzantine diplomacy in the area north of the Black Sea, the main emphasis is placed on the need to keep peace with the Pechenegs, not with the Russians (38). And in the thirteenth chapter of that same work, written by Constantine himself in 952, he included the Russians among the "shifty and dishonorable tribes of the north" who are forever making intemperate demands upon the government of Byzantium (39). It is very probable that Olga' s disappointment at the results of her journey to Constantinople in 957 prompted her decision to send two years later an embassy to Otto I (40). Whatever the particular aim of this embassy- whether ecclesiastical (as Adalbert would have it) or commercial and political (as Feidas, Arrignon, and Litavrin have argued)-its very fact is a measure of Olga' s failure to conclude a firm alliance with Byzantium. This alone makes the theory that during her stay in Constantinople Olga was, or became, a Christian highly improbable (41). In the last resort the question of the time and place of Olga' s baptism remains an open one. Its solution will be advanced only by a comprehensive study of the international relations of Kievan Russia, which in its turn depends on a thorough investigation of all the relevant sources. (1) Povest ' vremennykh let, ed. V. P. Adrianova-Peretts and D.S. Likhachev, (Moscow-Leningrad, 1950), 1, p. 49. Hereafter Povest '; English trans. S.H. Cross and O.P. Sherbowitz-Wetzor : The Russian Primary Chronicle (Cambridge, Mass., 1953), p. 86. Hereafter Cross. (2) See the survey (with bibliography) in M.V. Levchenko, Ocherki po istorii russko-vizantiiskikh otnosheniy (Moscow, 1956), pp. 223-34; G.G. Litavrin, " Puteshestvie russkoy knyagini Ol'gi v Konstantinopol'. Problema istochnikov," Vizantiisky Vremennik, 42 (1981) 35-48. (3) G. Ostrogorsky, " Vizantiya i Kievskaya knyaginya Ol β ga, in To Honor Roman Jakob -son (The Hague-Paris, 1967), 2, pp. 1458-73; German trans, in the same author's " Byzanz und die Kiewer Fiirstin Olga," Byzanz und die Welt der Slawen (Darmstadt, 1974), pp. 35-52. (4)J.-P. Arrignon, "Les relations internationales de la Russie kievienne au milieu du X c si è cle et le baptême de la princesse Olga," Occident et Orient au X e siecle : Publications de I'Université de Dijon, 57 (1979), 167-84. Russian translation (slightly adapted): " Mezhdunarodnye otnosheniya Kievskoy Rusi v seredine X v. i kreshchenie Knyagini Ol'gi," Vizantiisky Vremennik, 41 (1980), 113-24. (5) B. Φειδάς, " Ἡ ἡγεμονίς τοῦ Κιέβου Ὄλγα - Ἑλένη (945-964) μεταξύ Ἀνατολῆς καί Δύσεως "», Ἐ πετηρίς Ἐταιρείας Βυζαντινῶν Σπουδῶν, 39/40 (1972-73) 630-50. (6) A.N. Sakharov, " Diplomatiya knyagini Ol'gi," Voprosy Istorii, 10 (1979) 25-51; idem, Diplomatiya Drevney Rusi. IX - pervaya polovina X v. (Moscow, 1980), pp. 259-98. (7) G.G. Litavrin, " Puteshestvie russkoy knyagini Ol'gi v Konstantinopol'. Problema istochnikov," Vizantiisky Vremennik, 42 (1981) 35-48. (8) Ostrogorsky, " Vizantiya i Kievskaya knyaginya Ol'ga," pp. 1459-60; " Byzanz und die Kiewer Fürstin Olga," pp. 36-37. (9) Constantin VII Porphyrogenete, Le Livre des C é rémonies : Commentaire, (Paris, 1935), 1, p. xxvii. (10) Feidas, " Ἡγεμονίς, pp. 645-46. Feidas' reference to the Magyars is unfortunate: four years after their defeat at the battle of the Lech by Otto I they were not capable of threatening anyone. (11) Povest', p. 44; Cross, p. 82. (12) E. g. V. Parkhomenko, Nachalo khristianstva Rusi (Poltava, 1913), pp. 126-29. Cf. Levchenko, Ocherki, pp. 224-9. (13)Constantine Porphyrogenitos, De caerimoniis aulae byzantinaei, ed. J.J. Reiske (Bonn, 1829), 1, 594-98. Hereafter De caerim. (14) Ostrogorsky, " Vizantiya i Kievskaya knyaginya Ol'ga," p. 1471; " Byzanz und die Kiewer Furstin Olga", p. 50. (15) Arrignon, "Les relations internationales," p. 172; " Mezhdunarodnye otnosheniya ", p. 119. (16) The lower figures are given for Olga' s first reception, the higher ones for the second reception: De caerim., pp. 597-8. (17) See V. V. Mavrodin, Obrazovanie drevnerusskogo gosudarstva (Leningrad, 1945), p. 254; Levchenko, Ocherki, pp. 230-1. (18) Arrignon, "Les relations internationales," pp. 169, 173; " Mezhdunarodnye otnosheniya," pp. 118-20. (19)A.A. Vasiliev, Byzance et les Arabes (Brussels, 1950), 2,p. 368. The italics are mine. The importance of this text was noted by Feidas, " Ἡγεμονίς ", p. 642. (20) Povest ', p. 45; Cross, p. 83. (21) De caerim., pp. 590-91. (23) Puteshestvie Novgorodskogo arkhiepiskopa Antoniya v Tsar'grad, ed. P. Savvaitov (St Petersburg, 1872), p. 58. A.N. Sakharov may well be right in supposing that this "golden dish" was the same "golden dish adorned with precious stones" (χρυσῷ διά λίθῳ σκουτελλίῳ ) on which silver coins were presented to Olga during her audience with the emperor on 9 September 95 7, and that before leaving Constantinople she presented this dish to the treasury of Hagia Sophia: " Diplomatiya knyagini Ol'gi," p. 38; Diplomatiya Drevney Rusi, p. 280. Antony describes it as follows: "There is embedded in Olga' s dish a precious stone, on which is depicted Christ, and from that [image of] Christ people take seal impressions for all good purposes. The upper part of the dish is studded with pearls," ibid., p. 59. (24) Helen ceased to be the reigning empress on 9 November 95 9, the day of her husband's death. However, she retained the rank of Augusta and continued to live in the imperial palace until her death on 19 September 96 0: Theophanes Continuatus, Chronographia, Book 6 (Bonn, 1938), p. 473; Ioannis Scylitzae Synopsis historiarum, ed. I. Thurn (Berlin, 1973), p. 252. (Scylitzes dates her death to 20 September.) So, if Olga took the Christian name Helen in the life-time of the empress, the terminus ante quern for her baptism is 19 September 96 0. Sakharov, on the other hand, has argued that she was called Helen not in honor of Constantine VII' s wife, but after the mother of Constantine I (" Diplomatiya knyagini Ol'gi," p. 37; Diplomatiya Drevney Rusi, p. 279). He relies on a passage in the Russian Primary Chronicle: "She [i.e. Olga] was given in baptism the name Helen, like the empress of old, the mother of the Great Constantine' (Povesf, pp. 44; Cross, p. 82). In fact however, the passage implies no more than a comparison between the roles played by Helen and Olga in the conversion of their respective countries to Christianity. This comparison, heightened by the obvious parallel between Helen' s son Constantine and Olga' s grandson Vladimir, who made Christianity the official religion of the Russian state, was fairly standard in early medieval Russia. It was made quite pointedly by the Russian Metropolitan Hilarion about 1050: " SIovo o zakone i blagodati," in A Historical Russian Reader, ed. J. Fennell and D. Obolensky (Oxford, 1969), p. 15. (25) Povest, p. 45; Cross, p. 83. (26) Povest ', pp. 40-3; Cross, pp. 78-81. (27) Povest, pp. 28, 38; Cross, pp. 68, 76. (28) De Caerim., p. 664. (29) Theophanes Continuatus, pp. 476, 481. Cf. G. Schlumberger, Un empereur byzantin au X' si è cle : Nicéphore Phocas (Paris, 1890), pp. 44-96. (30) Several historians believe that Olga's long wait occurred before her first audience, and that she was made to wait for more than two months before she was received by the emperor: V.T. Pashuto, Vneshnyaya politika Drevney Rusi (Moscow, 1968), p. 67; A.N. Sakharov, " Diplomatiya knyagini Ol'gi ", p. 41. My reasons for believing this view to be mistaken will be given below. It is worth nothing that in 946 the envoys of the emir of Tarsos were granted their second audience with the emperor a few days after their first audience: De caerim., pp. 588-92. (31)The fact that the remaining members of Olga's embassy did not suffer similar monetary cuts shows that these cuts were not automatically applied to the whole embassy at its second reception. (32) D. Ainalov, "Ocherki i zametki po istorii drevnerusskogo iskusstva. II: O darakh russkim knyaz'yam i poslam v Vizantii," Izvestiya Otdeleniya Russkogo Yazyka i Slovesnosti, 13 (1908) 290-307. (33) Povest, pp. 24, 36; Cross, pp. 65, 74. (34) De caerim ., pp. 396-8. (35) No doubt this linguistic convention was not always strictly followed. Thus in the De administrando imperio the imperial stipend received by the prince of Taron is described as δωρεᾶς by other Armenian princes, jealous of his prerogatives: chapter 43, ed. Gy. Moravcsik (Washington, D.C., 1967), p. 194. But this is an Armenian, not a Byzantine, use of the term, and the rivals of the prince of Taron are concerned to make a point. (36) De caerim., p. 638. (37) J.B. Bury, "The Ceremonial Book of Constantine Porphyrogennetos," The English Historical Review, 22 (1907) 212-13. (38) De administrando imperio, pp. 48-56. (41) Feidas' attempt to argue that Olga was baptized in Constantinople after her second reception at the imperial court ("Ἡγεμονίς, pp. 637-38) seems to me unconvincing.